Enhancement cards permanently raise the stats on a player card. Rare+ player cards have 1-3 slots for Enhancement cards. 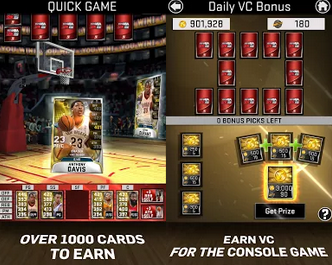 Enhancements drop from the Draft Board and the Daily VC Bonus. Higher rarity Enhancements improve stats even more! PRO cards get the highest number of slots from the 2 cards Combines to create the PRO card. Any enhancements on a player card are lost when combined. When Combined both PLAYERS are LOST and a NEW PLAYER is received. PRO PLAYERS have better stats and a higher FULL POTENTIAL. COMBINE MAX LEVEL. Players for the best FULL POTENTIAL. Training a player removes another player from MY CARDS to increase TRAINEE'S LEVEL. The better the players selected the more the TRAINEE'S LEVEL increases. AN SELECTED PLAYERS will be removed to make the TRAINEE stronger. TRAIN you PLAYERS to strengthen your QUICK GAMES LINE-UP and improve your chances in SEASON PLAY.